Recognizing mutual interests in eye care and simulation-based training, the Bascom Palmer Eye Institute and Gordon Center for Research in Medical Education (GCRME), both of the University of Miami Miller School of Medicine, and HelpMeSee, a non-profit humanitarian organization, today announced a unique partnership to train medical students using the HelpMeSee eye surgery simulator and simulation-based training curriculum. The University of Miami Miller School of Medicine is the first medical center in the United States to incorporate this first-of-its-kind virtual reality simulation technology in its teaching program. 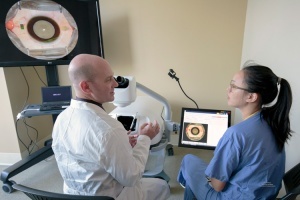 Bascom Palmer Eye Institute is ranked the nation’s best in ophthalmology by U.S. News & World Report, an honor it has received for the 17h time. It is also ranked as the #1 overall ophthalmology program, first in clinical care and first in residency program by Ophthalmology Times. In addition to its international reputation as one of the premier providers of eye care in the world, Bascom Palmer is the largest ophthalmic care, research and educational facility in the southeastern United States. Each year, more than 250,000 patients are treated with nearly every ophthalmic condition and more than 18,000 surgeries are performed. With five patient care facilities in Florida (Miami, Palm Beach Gardens, Naples, Plantation and Coral Gables at the Lennar Foundation Medical Center), the Institute serves as the Department of Ophthalmology for the University of Miami Miller School of Medicine, part of UHealth-University of Miami Health System. For more information, visit www.bascompalmer.org. For more information, visit the HelpMeSee website.